Posted on January 25, 2019 at 5:53 pm. Massachusetts is poised to become the first state to pass a resolution calling on Congress to begin impeachment proceedings against the President. On January 24, 2019, Massachusetts State Senator Jo Comerford introduced Resolution SD. 1565, drafted from our model resolution and citing our ten legal grounds for impeachment, urging Congress to conduct an impeachment investigation of the President. To date, seventeen cities and towns have passed resolutions calling on Congress to act on impeachment. Comerford said in a statement that it is a critical time to defend the U.S. Constitution and democracy, and emphasize that no one is above the law. “People from all over the commonwealth have stood up to demand Congress do their duty and hold President Trump accountable for his abuse of power and abuse of the public trust,” Comerford said. The resolution would follow local resolutions calling for impeachment proceedings to begin against Trump, including ones adopted in Amherst and Pelham, and is similar to a bill introduced in the California legislature. John Bonifaz … Free Speech For People cofounder and president, said he appreciates Comerford’s action because of the threat Trump poses. We applaud Senator Comerford’s leadership and action in holding the President accountable to the law! To read the full article in the Daily Hampshire Gazette, click here. Posted on January 18, 2019 at 3:51 pm. Posted on January 17, 2019 at 8:01 pm. Posted on January 15, 2019 at 7:56 pm. Free Speech For People Legal Director Ron Fein joined Sonali Kolhatkar on Rising Up With Sonali to discuss the latest revelations about President Trump, Russia, Michael Cohen’s upcoming testimony to Congress, and why Congress should start impeachment hearings now and not wait for the conclusion of the criminal investigation by Special Counsel Robert Mueller. Posted on January 10, 2019 at 8:56 pm. Free Speech For People President, John Bonifaz, joined John Iadarola of The Damage Report to discuss the recent op-ed, authored by John Bonifaz and Congresswoman Rashida Tlaib, in the Detroit Free Press, ‘Now is the Time to Begin Impeachment Proceedings Against President Trump‘, and to discuss why we do not need to wait for the conclusion of the investigation by Special Counsel Robert Mueller for Congress to begin impeachment proceedings against Trump. Posted on January 3, 2019 at 6:25 pm. Posted on January 2, 2019 at 11:14 pm. On December 29, 2018, Free Speech For People Board Chair, Ben Clements, joined MSNBC’s Frances Rivera on Weekends with Alex Witt to discuss the latest on the investigation of the President by Special Counsel Robert Mueller and the investigation of Trump’s business interests, including the Trump Organization. Free Speech For People recently renewed our call on the New York State Attorney General to begin an investigation into whether to revoke the corporate charter of the Trump Organization due to the company’s alleged criminal activities, including money laundering, tax evasion, fraud, facilitating unconstitutional foreign government payments (emoluments) to the president and concealing a political slush fund by invoicing bogus “legal services.” This renewed call follows the submission of a guilty plea by Trump’s personal attorney Michael Cohen for, among other charges, conspiring with the President to violate federal campaign finance law and evade regulatory scrutiny through a fraudulent scheme of concealing “hush money” payments and campaign expenses. Click here to learn more about the campaign to Dissolve the Trump Organization! Posted on December 18, 2018 at 6:41 pm. 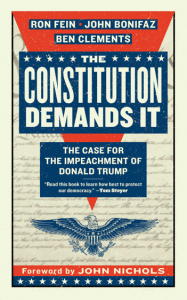 Impeachment has been in the news lately with the recent sentencing of Donald Trump’s personal attorney, Michael Cohen, and as the Mueller investigation continues. But we’ve known of Trump’s impeachable offenses since he took the oath of office. To purchase our book, click here. And to get involved in the movement to hold the President accountable to the law, click here.